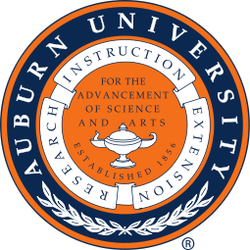 Auburn University, located in Auburn, Alabama, is a comprehensive land, space and sea grant research institution blending arts and applied sciences. The University continuously changes to accommodate today's needs, while still respecting the traditions and spirit of Auburn. As it grows and changes, Auburn will always continue its tradition of excellence. The main campus had an enrollment during fall of 2012 was 25,134. Auburn University offers 140 degree options in 13 schools and colleges at the undergraduate, graduate and professional levels. Auburn University is known not only for its academic excellence, but for its impact on Alabama as well. A recent study determined AU had nearly $4 billion economic impact on the state of Alabama, including a $ 1.5 billion impact on the economy and a $ 2.4 billion impact in "human capital." AU's Technical Assistance Center, a collaborative Engineering / Business outreach unit, performs hundreds of projects annually for state industry, generating millions of dollars in increased efficiencies and saving or creating hundreds of jobs statewide. For more than 30 years, mischievous and lovable Aubie has represented the university at events ranging from football games to grand openings and everything in between. Aubie is an eight-time UCA National Mascot Champion. Read more about his history, accomplishments and more by logging on here. A listing of the "First, Few, Only and Unusual" accomplishments can be found here. Auburn University is committed to preparing our students for today's global economy. The Global Gateway site provides information on the international presence of Auburn University such as the Office of International Education, which provides International Student/Scholar immigration advising, study abroad options and more, information on initiatives sponsored by the academic units, and international admissions for undergraduate and graduate students. With over 800 international students, more than 500 AU students studying abroad and a truly global faculty, AU provides its students and community with access to a world of opportunity. Auburn's athletic teams compete in the Southeastern Conference. Find out more about the Tigers by visiting the Auburn Tigers Web site. Since opening its doors in 1856, Auburn University has awarded more than 285,000 academic degrees. Our Alumni Association is one of the strongest in the SEC with 45,000 members. For more information about events, alumni clubs and more, click here.